Tubyaku Kosterkin. Photo (22K) by A. Lintrop 1989. Many years of his life Tubyaku spent in tundra like the hunter, fisherman, reindeer-rearer and practising shaman. 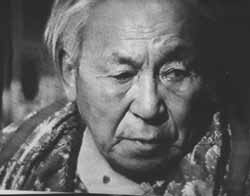 In the end of 1940's, when the local soviet authorities undertook the liquidation of shamanism in Taimyr, Tubyaku was imprisoned. He was indicted not directly on shaman's practice but on getting honorariums for his shaman's activities. After being released from prison in 1950s he continued to shamanise. Tubyaku's first helping spirit was thin she-reindeer. His chief helping spirit was eight-legged reindeer stag Hotarie. When summoned by the shaman Hotarie appeared, he often used other names according to circumstances. For example, the names the Water-stag, the Water-eagle, the Nail of the earth, the Privat Enterpriser have been used. Tubyaku completed the set of his helping spirits by the clean tent rites. So he got from the Tenth god an iron reindeer, from the Frosty god a hornless reindeer, from the Mistress of water a water-girl, from the Mistress of sun seven sun girls, from the Smallpox god seven women with dogs and from the Westerly god an iron horse. The latter named Mikulushka symbolised the soviet power and had very special sphere of action - he supported only official business. The other names of Mikulushka have been the Shameless and All the Soviet Power. Tubyaku also had his special informers - three Hositala spirits. One of them, Seimybtymy, had not eyes but could see everything. The second, Koubtumu, was without ears but heard all and the third, Nganabtumu, had not mouth but told to the shaman about everything. Click here to read some Tubyaku's incantation examples. 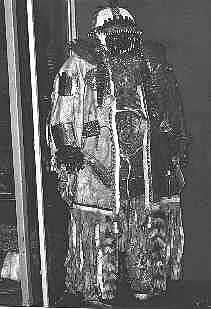 The shaman costume of Tubyaku as it was exhibited in the museum of Dudinka. Photo by H. Relve 1989.